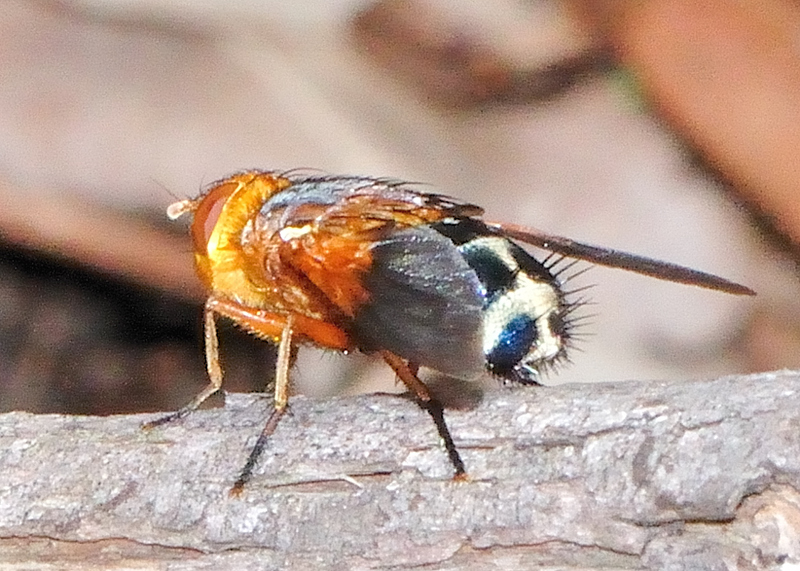 This page contains pictures and information about Tachinid Flies Subfamily Tachininae that we found in the Brisbane area, Queensland, Australia. 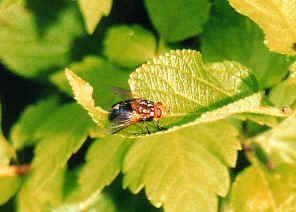 The Tachininae are mostly parasitic in Lepidoptera (moth and butterfly). 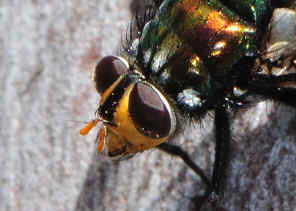 Flies in Tachininae are more diverse and include some of the largest, most colorful, and most bristly of tachinids. 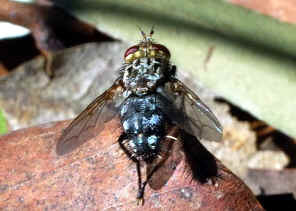 This subfamily also includes some of the smallest and least conspicuous tachinids. 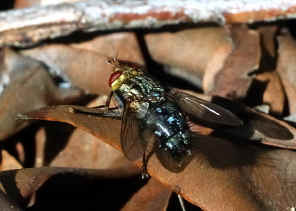 Four subfamilies are recognised in Tachinidae. However, it is believed should be more than four. At the moment, if the Australian tachinids that are clearly not either of the three subfamilies, they will be put in the subfamily Tachininae. Picture taken near Bulimba Creek in Wishart during mid summer. It was searching for something among the leaves. 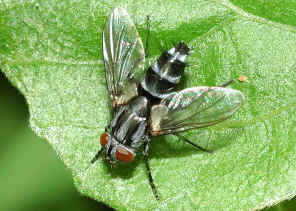 We found fly once in Karawatha Forest near the Lagoon on Sep 2010. Microtropesa sinuata, body length 12mm. 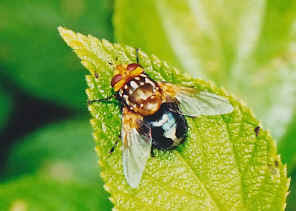 This is a very fat Tachinid fly. The abdomen is dark shiny blue background colour. 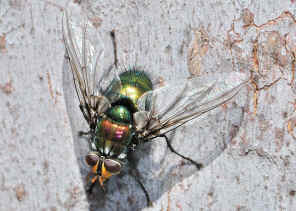 The thorax is shiny brown background colour. Both abdomen and thorax have a lot of brightly white triangular spots. It has a pair of big red eyes on the orange head. 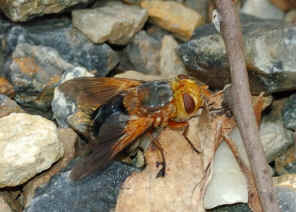 Its antenna is distinctive too - orange with black tips. We found it when it was feeding on flowers of Lantana plants. please check this page for more information. 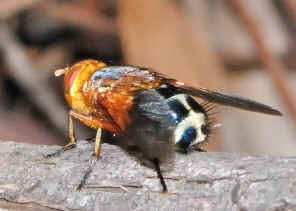 Microtropesa sp. body length 12mm. 3. A revisionary classification of the Rutiliini (Diptera: Tachinidae), : with keys to the described species - R. W. Crosskey, British Museum (Natural History), Bulletin, Entomology, Supplement 19, 1973. 4. A conspectus of the Tachinidae (Diptera) of Australia, including keys to the supraspecific taxa and taxonomic and host catalogues - R. W. Crosskey, British Museum (Natural History), Bulletin, Entomology, Supplement 21, 1973. Last updated: December 21, 2012.